Faculty of Law, IU celebrates the Constitution Day by organizing various events honoring the significance of the Day. Constitution day also known as the Samvidhan Divas is celebrated every year on November 26 to mark the day on which the Constitution of India was adopted. While the adoption of the Constitution took place on November 26, 1949, it came into effect on January 26, 1950, observed as Republic Day. Constitution Day was first celebrated four years ago in 2015, when the Narendra Modi- government decided to mark the day as a tribute to B R Ambedkar, who played a an important role in the framing of the Indian Constitution. On November 26, 1949, the Constituent assembly had met and with loud and prolonged cheers and thumping of desks greeted the passing of the Constitution. “It took two years, 11 months and 17 days to accomplish the stupendous task of drafting the Indian Constitution. The Indian Constitution that has over 90,000 words is the toil of and 271 men and women who were part of the constituent assembly that drafted it. By all means the Constitution serves as a powerful emancipation proclamation ending centuries of discrimination, economic, political and social exclusion for millions of people” shared the Faculty of Law, Integral . Dr. Rajendra Prasad, President of the Constituent Assembly, in his speech before putting the motion to pass the Constitution had paid tributes to Mahatma Gandhi and said that “I shall only hope that all those whose good fortune it may be to work this Constitution in future, will remember that it was a unique victory which we achieved by unique method taught by the Father of the Nation, and it is up to us to preserve and protect the Independence that we have won and to make it really bear fruit for the man in the street." After the Constitution was passed, the historic session of the Constituent Assembly ended with the singing of the National Anthem "Jana-gana-mana adhinayaka Jai Hey, Bharat Bhagya Vidhata," by Purnima Banerjee, a veteran freedom fighter and sister of the late freedom fighter, Aruna Asaf Ali. The draft of the constitution was prepared by the drafting committee under B.R Ambedkar’s aegis. According to the government notification, the Constitution Day was also a tribute to Ambedkar. 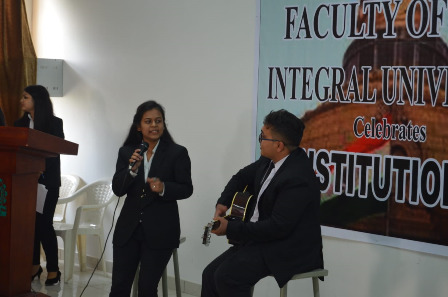 Faculty of Law, Integral University celebrated the Constitution Day on November 26, 2018, an important landmark in the country's journey as an independent, sovereign republic by organizing various events honoring the significance of the day. 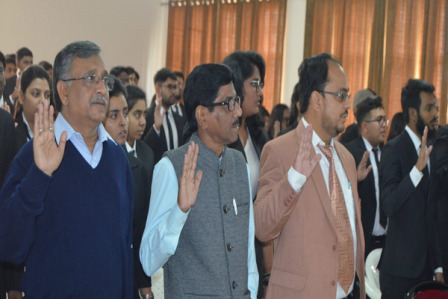 Prof.Munawar Alam Khalid, Dean Student Welfare, Integral University was the Chief Guest and Mr. Syed Kaleem Akhtar, Deputy Registrar, Integral University was the special guest to the ceremony. Three separate events were organized by the literary committee of Faculty of Law. 1st National Online Legal Essay Competition 2018 on the topic “Protection of Sexual Minorities: Social Morality vs. Constitutional Morality”: Essay Competition was successfully completed under the supervision of Mrs. Seema Siddiqui (Faculty In-charge of the competition. 1st Intra Departmental Debate Competition 2018 on the topic “Social Networking Sites are an effective means or just a sophisticated end for stalking people”. 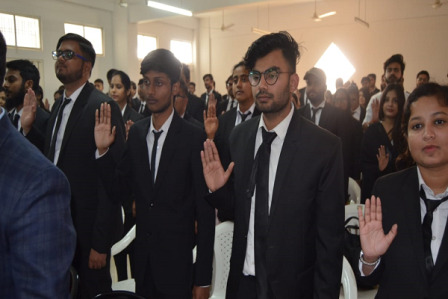 Debate Competition was judged by Dr. Asma Farooq, Associate Professor, Department of Commerce and Business Management and Dr. Naved Ahmed, Deputy Librarian and Library In-charge Integral University. Ramsha Hayat was adjudged first best speaker for the competition and Sachin Yadav was the second best speaker. 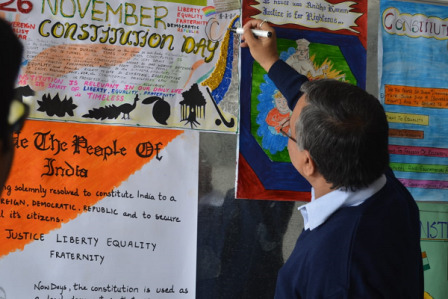 Poster Making Completion to signify the Role of Constitution in Our Daily Life: Competition was judged by the Chief Guest Prof M.A. Khalid. 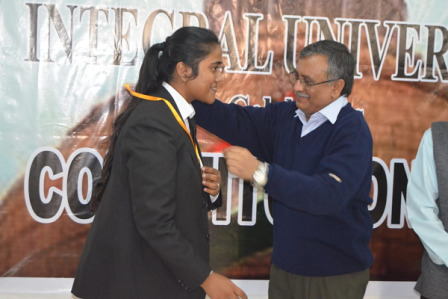 First position was secured by Himadri Goswami and Mantasha Ekram stood second. The Event concluded with the guests and students taking the pledge and the loud echo of the National Anthem .